Genesis Chapman: Fire on the Mountain is a new exhibition by the Taubman Museum of Art's first juried triennial winner, Genesis Chapman. The series centers around his personal struggle with the proposed Mountain Valley Pipeline, which will cross Chapman's homeland in several places. Chapman’s new works document the environmental impact of oil and gas pipelines across the United States. Chapman's ink on Yupo paper paintings mounted on wood-carved company logos document the destructive power of flame and smoke in almost hyperrealistic detail while the surrounding environment is left seemingly unfinished and stark white, perhaps alluding to a story that is still unfolding. The artist says of his process, "My drawings and paintings reflect the pattern, movement, and energy of nature." 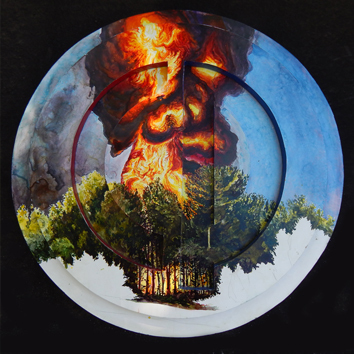 Chapman's forest fire paintings are timely on a national scale, though they were initially inspired by a brush fire that engulfed a portion of the land near his Bent Mountain cabin in November 2012. 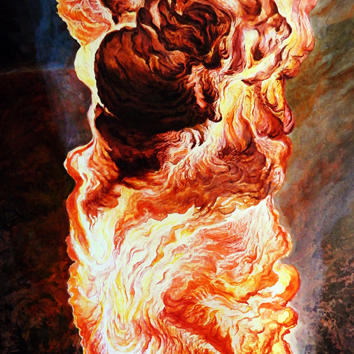 The showpiece of this exhibition, an 8-foot-tall depiction of an explosion, is titled Pillar of Fire: Mountain Valley Pipeline Nightmare. This large-scale ink painting is a fearful imagining of what could happen on the stretch of Bent Mountain and Bottom Creek visible from the artist's cabin if there were a Mountain Valley Pipeline explosion. At the heart of Chapman's extensive environmental studies, he simply states, "My art aims to examine and investigate Bent Mountain, Virginia, which is the place I grew up, and a place I deeply love." The Taubman Museum of Art's Homeward Bound triennial exhibition in 2017 was a major juried show presenting work in all media by artists living in the Commonwealth of Virginia. Guest juror Bradley Sumrall of the Ogden Museum of Southern Art chose 74 works by 59 artists out of a total of 1,137 artworks submitted. Chapman received his Bachelor of Arts from the Kansas City Art Institute and his Master of Arts in painting from Virginia Commonwealth University. His work has been shown in exhibitions in Kansas, Virginia, and New York, most recently in a solo exhibition at Art Space in Richmond, Virginia. Genesis Chapman: Fire on the Mountain is curated by Eva Thornton, Curatorial Coordinator, and is on view in the David R. and Susan S. Goode Regional Gallery March 10-August 12, 2018. Meet the artist during a special exhibition opening and talk on Friday, April 6! Click here to learn more and register.